I want you to commit to spending just 20 minutes a day focused on God. I know, that sounds both possible (hey, what’s twenty minutes!) and impossible (but I’m far too busy to cram in *another* twenty minutes!). For some, finding 20 minutes more per day will be a challenge in itself. Obviously that will mean making a sacrifice – giving something up. But what you give up can be different each day. One day you might spend less time on Facebook (gasp! ), another day less time listening to music, another day tell your family ‘I’m off to spend 20 minutes with God – see you on the other side’. 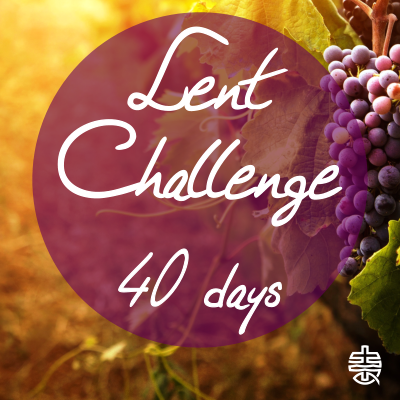 But I challenge you to make 20 minutes each day which are devoted to God. Those who took up the challenge found it really rewarding, so I want to encourage you to do it this year. Whether for the first time, or to attempt it again and perhaps keep up and finish it this year. But even if you completed it last year, do it again this year and allow God to speak to you again through Scripture & the reflections/resources. Below you’ll find links to last year’s daily reflections set our against this year’s dates. Bookmark this post and come back to it each day to find your way to the appropriate days reflection. Enjoy the journey! Note: we’ve included Sundays below which is why it counts up to 46 days, but Sundays are ‘feast days’. On Sundays (marked bold below) instead of a written reflection there is a video or picture to reflect on. 16th April – He Is Risen!